You have your diagnosis, you've done your research, and you now know more about FPIES than most medical doctors. Every waking moment of your day is spent making sure that your child only eats safe foods. But who else knows the ins and outs as well as you do? Even your spouse would need a book's worth of instructions on how to keep your child safe, because you're the FPIES point person in your family. Now think about what would happen if you weren't there to advocate for your child? Once we got a handle on Matthew's FPIES, that "what if" question kept popping into my head. Our family knows first hand how quickly the unexpected can happen, and how confusing the aftermath can be. I'm not trying to scare anyone, but I do want to give you food for thought. We were in a roll over accident when Abby, our oldest, was 4 months old, so we know first-hand the chaos that happens after an accident. About how little time you have before someone rushes off in an ambulance. That your diaper bag is still stuck in the car that's sitting upside-down in the middle of an intersection. What it's like when the adults are sent to one hospital by ambulance, and the kids are sent by ambulance to the children's hospital. Luckily none of us were seriously injured, and I was OK enough to ride along with Abby to the children's hospital, though I did have physical therapy for a few months to recover from a rotator cuff injury. Nick and his brother were both sent to the "adult" hospital with their injuries. What if something like that happened again, and none of the adults were OK enough to go with Matthew? Who would tell the hospital what was safe/unsafe for him to eat? That's why we have medic alert. It's only $30 a year to give us peace of mind...to know that if something did happen to us and strangers were taking care of Matthew, they would be able to call that number and #1 get an explanation of what FPIES is, and #2 have access to what his trigger foods are. 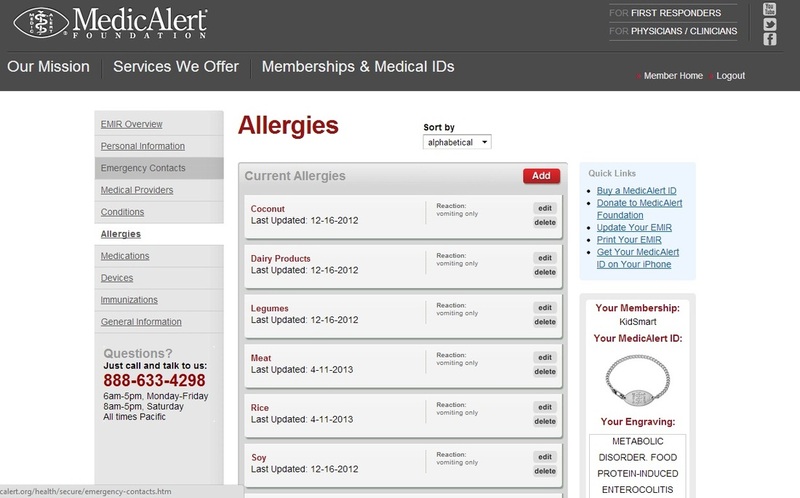 We chose to use the Medic Alert service simply because it's the most recognizable. And we went with the standard stainless steel bracelet because it is so easily recognized by medical personnel (you can see an image of the bracelet we chose in the screen shot at the bottom of this page). There are a lot of "cooler" alert bracelets out there, but if it looks like a play bracelet would the nurses and doctors even pay attention to it? Maybe they would, but we're not paying for this for it to look cute, we're spending our money in the hopes that it will save Matthew from a reaction. Well...we're actually spending our money but praying we'll never use it. If you don't have some type of medical alert service for your LO, you should seriously consider it. Can you spot the bracelet? Once you are a member it's really easy to add your child's triggers, the contact info for their doctors, your emergency contact info, and any other information you'd like listed (you can even list that they are an organ donor). When we found out about Matthew's ketone utilization defect we added "metabolic disorder" to his file just by logging in. The website is easy to use and has a simple layout, so updating your child's file for new triggers (or other info) is painless.